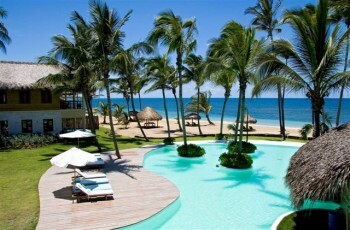 Located in Punta Cana, Dominican Republic, this secluded beach resort provides supreme luxury in an ideal location. Whether cooling off under the shade of a palm tree or sunning on the sugary sand of the beach, inviting terraces and lounge sofas can be found throughout the tropical gardens and stunning seaside of this luxury resort. Even these secluded spots are not spared from the unexpected personal touches of the warm and attentive staff. The luxury resort’s dedicated round the clock service strives to create a haven for all those seeking rest and relaxation. The 53 suites of this luxury resort are spread over 18 villas and come complete with views of the ocean, gardens, and pools. The traditional Caribbean architecture embraces the use of natural stone, various hardwoods, and cane-thatched roofs. The interior design of the luxury suites complements the picturesque ocean- front surroundings of the Dominican coastline. The suites reflect an elegant yet understated luxury style, and include details of art pieces, natural elements, neutral colors, soft fabrics and fine amenities.